After enjoying the music and food at the 36th Annual Deep Pit Barbecue at the Hat Creek Hereford Ranch Campground on Saturday July 18, my wife Linda and I were uncertain what to do next. I had been thinking of checking out some local fishing spots to get pictures for a story on fishing. However, we were both a little tired so we decided to head back to Burney. 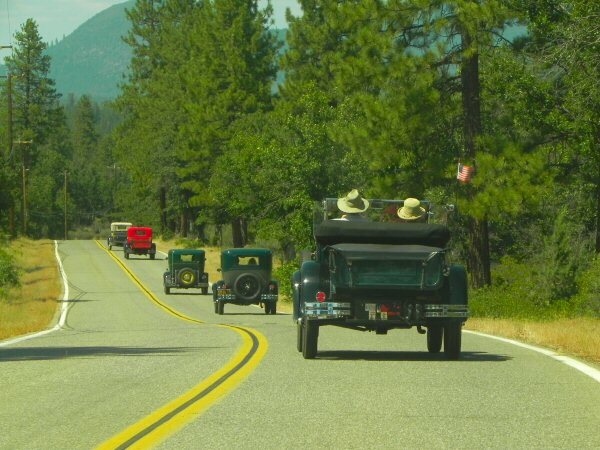 Heading south on highway 89, a small caravan of Model A Fords was slowing traffic. Linda loves vintage cars so we decided to let the fast vehicles move on and just join the parade of old cars. The Model A’s turned right on Cassel Road and we followed. We drove over the Rising River, past Clint Eastwood’s ranch and into Cassel. As we drove through Cassel, I saw a line of fishermen on the bank of Hat Creek across the road from the PGE campground. I was tempted to stop but instead continued on with the vintage parade. We had seen these cars at the barbecue but we didn’t know where they were from or where they were going and we were curious. When they passed Baum Lake Road, however, we decided to turn right and go over to Crystal and Baum Lakes. As we drove into the parking area at Baum Lake, Linda let out a little exclamation of joy. 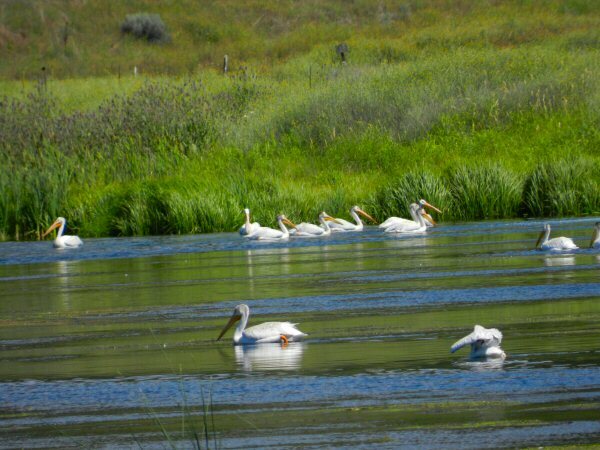 The lake was filled with American white pelicans that we loved to photograph. There were a number of families picnicking by the lake. 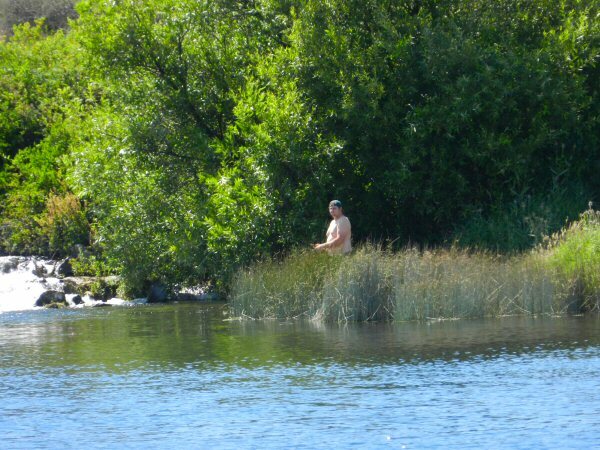 One man was paddling in a small rubber raft through the reeds and grasses that had grown up in the recent hot weather. Over by the white water where the water from Crystal Lake flows into Baum Lake two more young fellows were fishing. Baum Lake is named after Frank Baum, a world-famous hydroelectric engineer who designed the hydroelectric power sites on the Pit River from Pit 1 to Pit 8. While investigating potential power sources in Shasta County in the early 1900’s, he bought the Crystal Lake Ranch where he later built the Hat 1 and Hat 2 power stations. He also built a home where the water flows between Crystal Lake and Baum Lake. Baum lived there with his wife until his death in 1932. The house burned down in 1936 and was never replaced. In 1939, his widow, Mary, sold the property to PG&E. PG&E later leased some of the land across the road from the lakes to the state of California where they began the Crystal Lake Fish Hatchery in 1947. 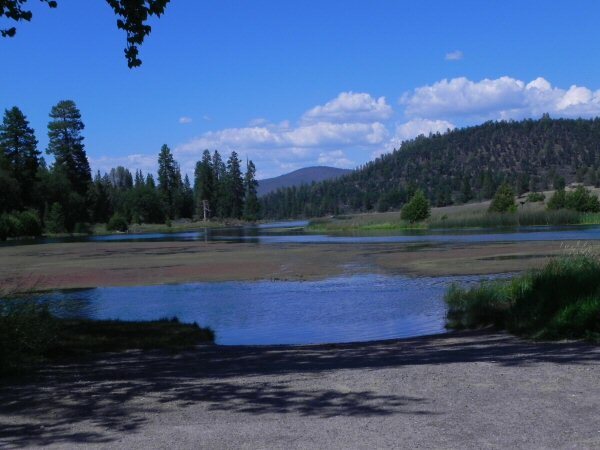 The Pacific Crest Trail (PCT) runs right over the bridge between the two lakes where Baum’s home was and then continues up alongside Baum Lake towards Hwy 299. After Linda and I took some pictures, we decided to head home. At the entrance to the park, a young man and woman with back packs were standing by the road. “Hi!” I said, “Are you hiking the trail. “Yes,” the bearded young man answered. So we turned around and drove into the parking lot of the fish hatchery. The funny thing was, when we drove in, we saw the very cars we had been following parked by the table where the hikers were sitting. So, while I introduced myself to the hikers, Linda went to meet the motorists. 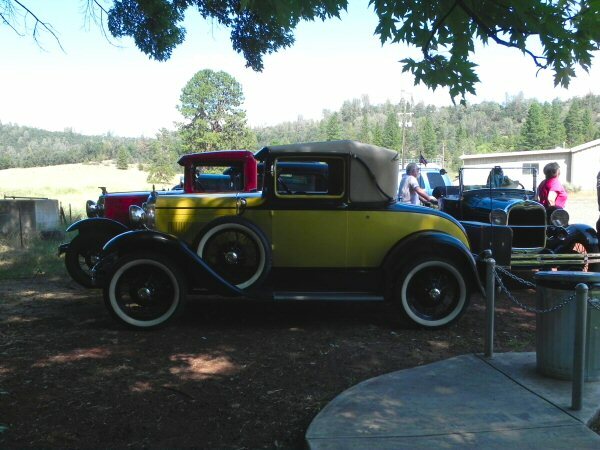 They were members of the Model A Club of Quincy on a tour of Northern California. I introduced myself to the hikers. There were three now because they had found their friend, Kelly Cohoe, from Portland Oregon. 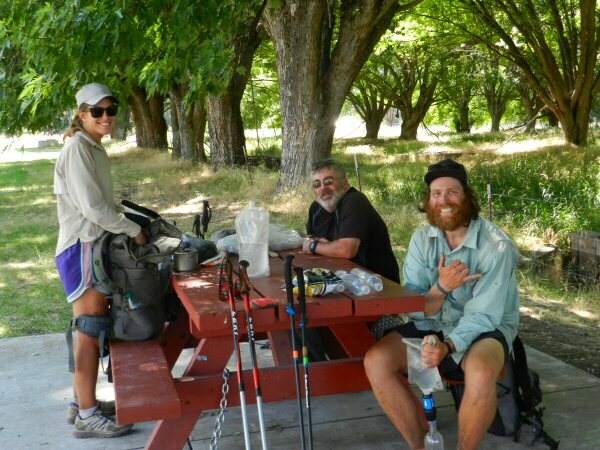 The two other hikers we had met earlier were Sara Bishop from New York and Adam Kirby from Seattle, Washington. Adam was hiking the whole 2,660 miles of the PCT northbound. He had started April 21th. Sara was also hiking the whole trail. She had begun hiking north on April 26th. 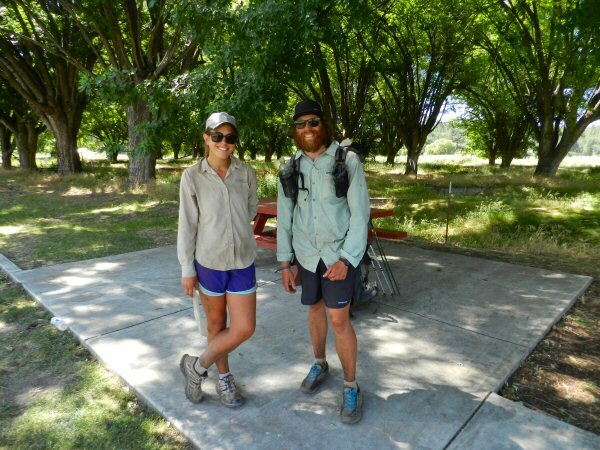 They had been hiking together since they had met at about mile 600. Adam said that he was hoping to reach the end of the trail before the end of September. Kelly, whom they called “Flying Eagle,” was a section hiker. This year he was hiking 1065 miles. Once he finished, he would have hiked the entire trail. Kelly had met Sara and Adam the night before when they had camped at the Hat Creek Hereford Ranch Campground, the very place where Linda and I and the Model A Club had just been at the barbecue. But while we had been enjoying a hefty barbecue and music and touring, the hikers had been hiking almost 30 miles on a stretch with no water. So they were very happy to have this break, refill their bottles and rehydrate. We talked for awhile about their journey. I learned that a zero is a day that a person logs no miles on the trail. A nero is a day that one only hikes half or less of their normal days hike. These hikers normally hiked 22 to 30 miles a day. I told them that Burney was a PCT friendly town. There are several access points to the trail including Baum Lake, a station near Hwy 89, the crossing at 299, Burney Falls State Park, and Rock Creek Falls. Many of the Burney Residents enjoy giving hikers rides to and from Burney where there is a Safeway store and a health food store where they can stock up on food and drink. 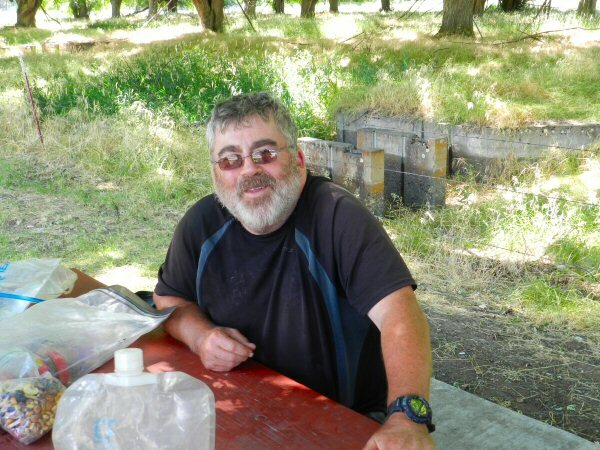 Burney also has other local businesses who like to serve the hikers and residents who are willing to supply a place to stay or camp if they want to take a break. It’s also a great rendezvous point for people who want to meet friends or loved ones who are hiking the trail. Burney is just over half way from Mexico to Canada. After chatting for awhile, Linda and I wished them well, jumped in our Jeep and headed to Johnson Park for ice cream. Alex Colvin is co-owner of The Lace Gallery in Burney, California. He previously wrote for non-profit corporations in the Washington-Baltimore Metropolitan Area. Since returning to Burney, where he has deep family roots, Alex and his wife Linda have dedicated themselves to exploring and photographing the natural beauty of Northern California.